The Israeli military intelligence company that managed passenger screening and security operations at the key airports of 9-11 also operates one of Germany's largest ports on the Baltic Sea. ICTS, the Israeli company responsible for passenger screening on 9-11, operates the German port of Rostock. 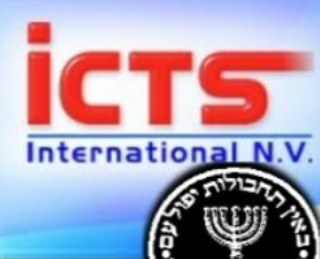 International Consultants on Targeted Security (ICTS International N.V.), the Israeli company headed by the Mossad veteran Menachem J. Atzmon, owns Huntleigh USA, the company that ran airport security and passenger screening operations at Boston's Logan and other critical airports on 9-11. 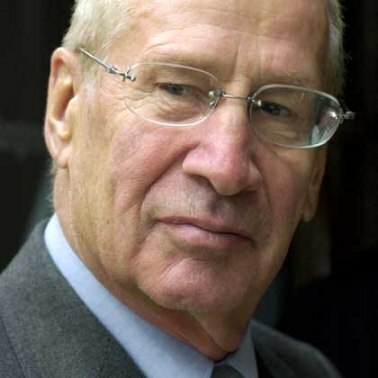 Huntleigh, which is owned by the criminal-run outfit ICTS, is one of the main defendants in the 9-11 tort litigation, and has been protected by the Zionist judge, Alvin K. Hellerstein, who has blocked all attempts for a trial to find those responsible. Atzmon, a convicted criminal of the Likud Party in Israel, owns and operates Seehafen Rostock, the largest cargo port of the former East Germany, a position he has held since January 1998. That an Israeli criminal has been allowed to operate one of Germany's largest ports illustrates the degree of Mossad influence in Germany. Israeli ownership of the port operations of Rostock is, however, just the tip of the Zionist iceberg that controls Germany. The massive clouds of dust that accompanied the destruction of the three demolished towers on 9-11 presented a mystery that needed to be solved in order to understand what really happened during the explosive demolition of the Twin Towers and WTC 7, the three towers owned or leased by the Zionist Jew Larry Silverstein. Some 425,000 cubic meters of concrete from the 220 floors of the Twin Towers completely disintegrated before they hit the ground and formed the most substantial part of the immense pyroclastic clouds of hot dust that rolled down the streets of lower Manhattan on 9-11. 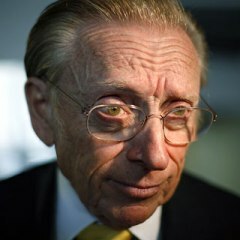 Larry Silverstein, a leading Zionist fund-raiser, owned or leased all three towers that were demolished on 9-11. Silverstein, along with President Bill Clinton and others, was accused of being part of a massive drug smuggling scheme in a lawsuit that was squashed. Although the Zionist-controlled U.S. government and controlled media claim that the towers fell in non-explosive pancake-like collapses, no evidence of the 220 concrete floors or the metal pans that held them were to be seen in the pile of rubble. What really happened to these fundamental elements of the structures and what caused the pulverization of the concrete floors --and everything on them? 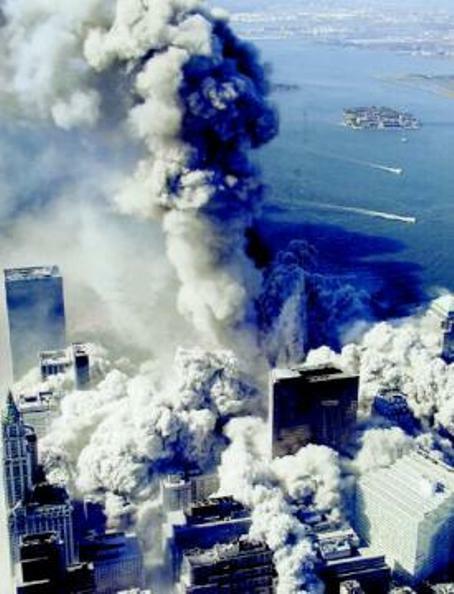 The concrete floors of the Twin Towers were pulverized into pyroclastic clouds. Large amounts of active super-thermite were found in the dust. In November 2001, as the administration of George W. Bush began fighting the Israeli-designed "War on Terror" in Afghanistan, I decided to move my family to Germany. My early research of the available evidence and news reports strongly indicated that Israeli military intelligence had carried out 9-11 as a false-flag terror operation to be blamed on Osama Bin Laden's Al Qaida. The Zionist-controlled U.S. government and media pushed for the invasion and occupation of Afghanistan based on this unproven version of events. The government and media were evidently involved in a criminal cover-up of what really happened. It didn't seem safe or prudent to pursue critical 9-11 research in the United States as the nation went to war based on an explanation I had already found to be a pack of lies. In August 2006, after being tortured with a TASER and having my right elbow broken in a pre-planned undercover police action at my home, I realized that my instincts were right in 2001 and that the U.S. was still not a safe place to investigate 9-11. 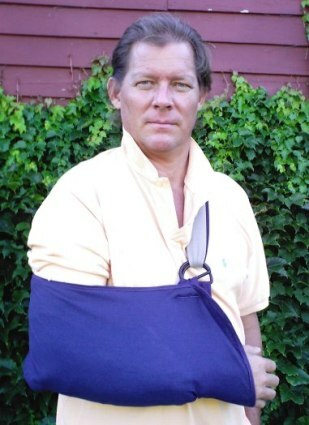 Bollyn after being assaulted and TASERed by a three-man squad of undercover tactical police at his home in August 2006. The Bollyn family had been home for less than two weeks before the police attack. At the end of November 2001, I was able to interview Andreas von Bülow, a former parliamentarian and an expert on intelligence matters at his home near Cologne. He and I saw eye-to-eye on the role played by Israeli intelligence in the false-flag terror attacks of 9-11. I also spoke to other former senior officials of German intelligence agencies who provided me with valuable insights about the terror attacks that were allegedly partly engineered in Germany, as the official story goes. The pile at Ground Zero was still smoking in November and emitting huge amounts of nano-sized particles produced by the incredibly hot thermitic reactions in which iron was boiling beneath the rubble. It would be another month, until the end of the year, before the fires were put out and even longer before crews reached to the bottom of the pile where pools of molten iron were found, a discovery that led directly to the now proven thesis that Thermite was used to destroy the three towers. The bluish smoke that rose from the pile of rubble was primarily composed of extremely toxic nano-sized particles created by fires hotter than the boiling temperature of iron. These fires were the result of large amounts of thermitic material reacting beneath the pile. The Zionist-controlled government and mass media refuse to deal with this evidence because it would reveal that the official version about 9-11 is nothing but a pack of lies. Shortly after arriving in Germany, I was introduced to a former East German intelligence agent, who I told was Frau Marek. I don't know what her real name is. Frau Marek, I was told, had been one of the East German (DDR) "beautiful young swallows" of Markus Wolf, the German Jewish communist who co-founded and ran the DDR's Hauptverwaltung Aufklärung (HVA), the foreign intelligence division of the Ministry for State Security, commonly known as the Stasi, from 1953 until 1987. Markus Wolf was born in 1923 in the southern German town of Hechingen, the home of many influential Jewish families. Wolf, whose Jewish communist family spent the war in the Soviet Union, was sent from the Soviet Union to Berlin after the war with Walter Ulbricht, the founder of the totalitarian East German state, the DDR. Wolf worked as a journalist for a radio station in the Soviet Zone of occupation and was among the observers of the Nuremberg Trials. 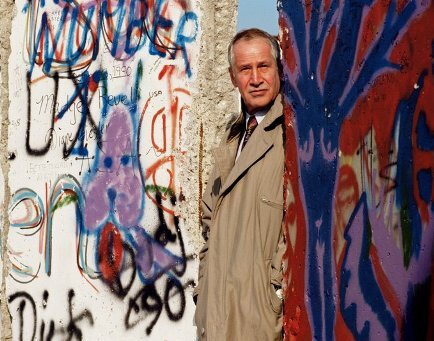 Markus Wolf, the intelligence chief who helped create the DDR with Walter Ulbricht, at the Berlin Wall. Wolf died on November 9, 2006, the 17th anniversary of the fall of the wall. Frau Marek, who I met on several occasions, had worked for several intelligence agencies including Israel's Mossad, by her own admission. As a "swallow" for Markus Wolf and the Stasi, I was told that Marek had worked to infiltrate NATO by seducing high-level officials. She had a background in physics and told me that she had information about a directed-energy infrared beam weapon that had been developed by the Soviet Union. This infrared beam weapon, she said, could have been used on 9-11 and, if so, could have been the cause of the pulverization of the concrete in the towers. I subsequently wrote an article that discussed Frau Marek's supposed Russian deep infrared beam weapon that was published in the American Free Press in February 2002. The article, entitled "Laser Beam Weapons and the Collapse of the World Trade Center," was the first article that discussed the notion that a Buck Rogers-type energy weapon might have been used to pulverize the concrete of the World Trade Center. Television viewers saw the immense amounts of dust, described by one observer "as if some high-energy disintegration beam or laser had been focused on the towers, and pulverized the concrete into minute particles of ash and dust." Frau Marek told me that she was a former East German physicist and had studied Soviet infrared technology and plasmoids during the 1960s and 1970s. She described having been involved in the demonstration of a Soviet directed-energy beam weapon in 1991 for the U.S. Air Force in Weimar (DDR). She said there was evidence that a beam weapon using "deep infrared" radiation had been used to bring down the WTC. Although I thought Marek's theory was far-fetched, some people are still promoting this theory in spite of the published scientific evidence of super-thermite found by Dr. Steven E. Jones in the dust of the demolished towers. 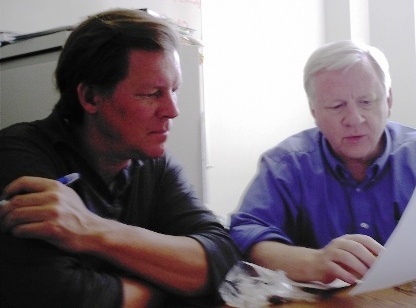 The author and Professor Steven E. Jones looking at evidence of Thermite in March 2009. Both Bollyn and Jones suffered professional setbacks as a result of their research in the summer of 2009. In the same article I wrote about U.S. and Israeli military efforts, since at least 1995, to develop an advanced infrared beam weapon under a joint "anti-missile" program known as the Tactical High-Energy Laser (THEL) weapon. Although I found Frau Marek's theory interesting, it seemed far-fetched given the abundance of evidence of explosions in the demolition of the towers. Having seen how steel beams and debris were propelled hundreds of feet from the buildings it seemed clear that there had been powerful explosives placed in the towers. Marek's theory was interesting primarily because it was an attempt to explain the mysterious pulverization of the concrete in the floors of the towers. With the discovery of chips of a nano-composite super thermite in the dust, however, the precise cause of the pulverized concrete has now been revealed. 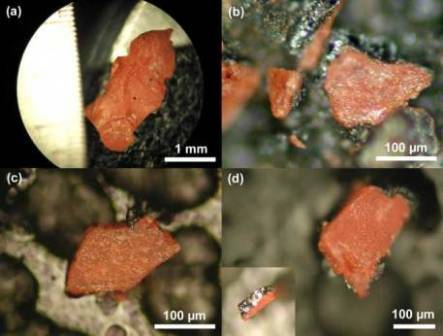 Chips of the active thermitic material found in the dust of the World Trade Center. 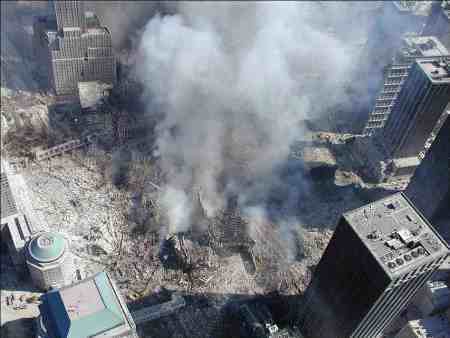 Did Al Qaida put this extremely powerful nano-composite explosive in the Twin Towers? This layer of super-thermite was probably sprayed on the bottom of the floorpans. From the amount found in the dust, the scientists estimate that tens of tons of this material had been applied inside the towers. While I had no interest in meeting Frau Marek afterwards, I have been told through our mutual acquaintance that she is always very interested to know where I am. Why, I wondered, would a former agent of the Stasi and the Mossad be interested to know where I am? And why had she provided me with the story about the infrared beam weapon in the first place? Israeli intelligence has penetrated East Germany deeply since the fall of the Berlin Wall and the evidence suggests that this relationship probably goes back several decades if not all the way to the founding of the DDR in 1949. Wolf, according to an extensive article by Louis Rapoport, had deeply penetrated international terrorist groups. Abu Nidal, for example, a notorious Palestinian terrorist from the 1970s, was based in East Berlin, but who was really managing him -- and to what end? Today, senior officers from the Israel's Mossad run the port of Rostock, the largest in the former DDR. The Mossad firm that operates the port is part of Menachem Atzmon's company, International Consultants on Targeted Security (ICTS), the same company that ran airport security and passenger screening operations at the key airports on 9-11 through their wholly-owned subsidiary, Huntleigh USA. Atzmon is an Israeli who was convicted of crimes related to illegal fund-raising for the Likud Party of Ariel Sharon, Ehud Olmert, and the current Israeli Prime Minister, Benjamin "Bibi" Netanyahu. He was co-treasurer of the Likud Party along with Ehud Olmert when the crimes were committed although Olmert was acquitted while Atzmon was convicted. Why would the German state allow a foreign company headed by a convicted criminal to run the port operations at one of the country's biggest ports? What does this say about Israeli influence at the highest level of the German government? Why is Israeli intelligence interested in running a port on Germany's Baltic coast? What kind of weapons smuggling and other criminal operations is the Mossad running out of Rostock? The fact that the Mossad runs one of the largest ports of Germany is just the tip of the Zionist and Israeli network that operates in the unified German state. Israeli intelligence owns scores of companies in Germany and has a great deal of influence in the politics of the nation. It is Frau Marek's connection with the Mossad, I suppose, that is behind her giving me the story about the Buck Rogers infrared energy beam and 9-11. Given the discovery of super-thermite in the dust of the World Trade Center, I can see that this story was an intentional attempt to mislead and confuse the issue about what really caused the pulverization of the World Trade Center, which is why I have not included it in my book, Solving 9-11: Exposing the Deception that Changed the World.